Clinical Immunobiology, Volume 3 covers a variety of methods used for assaying the immune status of an individual. This volume is composed of 21 chapters and begins with a presentation of the background and issues to which clinical tests would be applied. The succeeding chapters outline the methodological procedures used in the analyses. Other chapters present some examples of the kinds of data that can be generated with the procedures used and provide guidelines for interpretation of the tests. The remaining chapters discuss the value of the immunological test procedures in differential diagnosis and analysis of diseases. These chapters also explore the usefulness of these procedures in prognosis of disease and the consequences of immunological manipulation undertaken for treatment or prevention of disease. 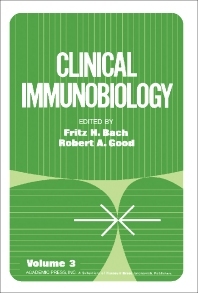 This book will be of great value to clinical immunobiologists, biochemists, and researchers.